Yep…time for another fun Technostamper Monday Lunchtime Sketch Challenge and I decided to ‘celebrate’ with some fun balloons! I thought that print from Best Year Ever SAB dsp sort of looked like confetti so I thought using that and adding balloons would be fun for the sketch this week. And yes…I was crazy enough to cut out those streamers for the balloons – you do know I like to cut things out! Best Year Ever (SAB) dsp – 3 1/2 x 1 1/4. Cut out three and add to card front. Stamp solid balloon using Crushed Curry then add the confetti using Soft Sued. 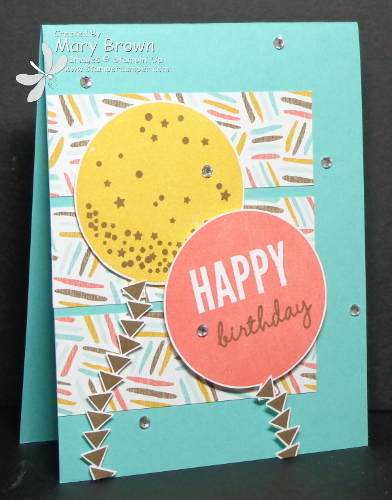 Stamp Happy balloon using Calypso Coral then add birthday using Soft Suede. Cut out balloons using framelits. Stamp streamers using Soft Streamers cut out and add behind balloons. Add Crushed Curry balloon using single dimensionals and Calypso Coral balloon using double layer of dimensionals. Such a GREAT sketch…I hope you can join the fun! Don’t forget to check out the other members of the team and remember go to the Technostamper blog to play along! 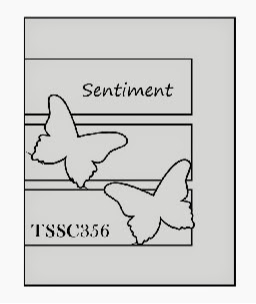 This entry was posted in Sale-a-bration, Spring Mini, Technostamper Challenge and tagged Celebrate Today. Bookmark the permalink. This is darling, I love what you are doing with this set. I the fussy cutting of the streamers really adds to the entire card. I always love your work, thanks so much Mary for all the great samples each week!